East Indies Tea Auction in London. 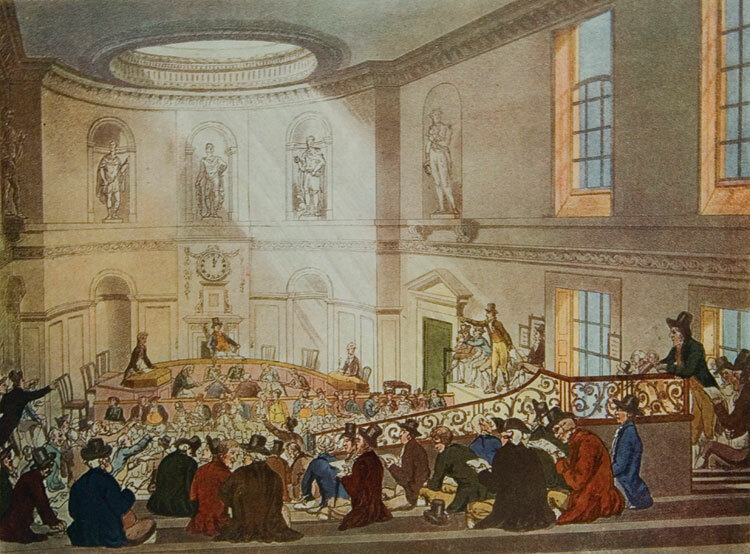 English color engraving. What tea was thrown overboard in Boston Harbor? All the East India Company tea aboard the ships docked in Boston Harbor on the evening of December 16, 1773 was produced in China, not India. Tea would not be cultivated in India or Sri Lanka until the 19th century. It was all loose tea because the colonists had no taste for tea bricks, and tea bags were still 150 years in the future. Benjamin Woods Labaree’s The Boston Tea Party says the three tea ships contained 240 chests of Bohea, 15 of Congou, 10 of Souchong (all black teas), 60 of Singlo, and 15 of Hyson (both green teas). Tea Garden in China. English engraving, 1700. It may surprise you to know that green tea accounted for about 22% of the shipments’ total volume and 30% of the value. One-third of the tea exported from China in the 18th century was green tea, with spring-picked Hyson being one the favorites. The first tea plucked in the spring is always the finest, which the Chinese designated yu-tsien or before the rains tea. The English traders who bought the tea in China thought the Mandarin name of this tea sounded like the name of a wealthy East India Company director in London named Phillip Hyson, and forevermore the young spring tea took on Mr. Hyson’s more pronounceable moniker. Hyson was a favorite tea of both George Washington and Thomas Jefferson. Singlo green tea was picked later in the season and the leaves were a bit larger. It tended to spoil sooner than other teas and was not widely known in the colonies. It was only included in the ill-fated shipment because the East India Company had quite a bit of stock that needed to be liquidated before it became undrinkable. 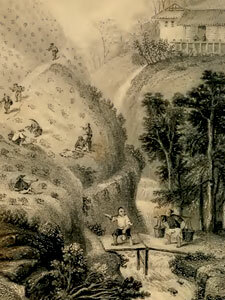 They wanted to introduce the tea to the colonies in hope that American’s would develop a taste for it. A few chests were aboard all seven ships which left London bound for Boston, New York, Philadelphia and Charleston in late summer 1773. 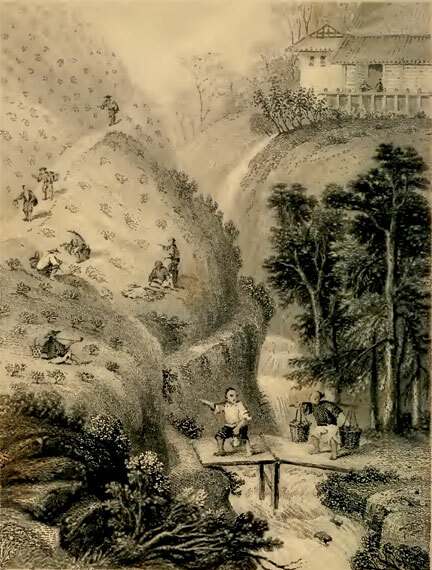 But the bulk of the tea that westerners consumed was common black tea known as Bohea (boo-hee), a corruption of the name for the Wuyi mountains south of Shanghai. The tea was so popular, that the word Bohea became the slang term for tea. Last Night 3 Cargoes of Bohea Tea were emptied into the Sea. This is the most magnificent Movement of all. There is a Dignity, a Majesty, a Sublimity, in this last Effort of the Patriots, that I greatly admire. One London publication described Bohea as infusing a dark and dull brownish red color which, on standing, deposits a black sediment. The liquor is sometimes faint, frequently smoky, but always unpleasant. The superior form of Bohea is known as Congou. Seventy percent of the tea imported by the East India Company was Congou (kung-foo.) It brewed a deep transparent red liquor with a strong and pleasant bitter flavor. The addition of milk surely added to the enjoyment of this beverage. Souchong is a classic black tea from the Wuyi Mountains of Fujian province which has a very distinctive smoky aroma. The original term souchong (xiaozhong) means “small leaf variety,” and refers to a family of tea cultivars that existed in this famous tea-growing region of Fujian since 1717. The souchong teas drunk by early colonists would have had a very slight smoky aroma which the tea leaves picked up during the drying process. Most of today’s souchong exports are intentionally smoked with smoldering pinewood and are called lapsang souchong. 12 chests of Souchong weighing a total of 684 pounds were aboard the ships in Boston Harbor. Certainly, all the teas tossed overboard would disappoint a modern tea drinker because they were way past their prime. The Boston teas were plucked in 1770 and 1771, transported by ship to London warehouses where they sat for a couple of years, and finally placed aboard ships bound for the colonies in October 1773. Forget taxation! The colonists should have been more offended by the slight regard King George showed toward their good tastes!